Mayoral candidate Ernesto Lugo speaks Tuesday at a news conference in Donna. DONNA — Mayoral candidate Ernesto Lugo blasted city officials once again Tuesday for proclaiming him ineligible to be mayor. 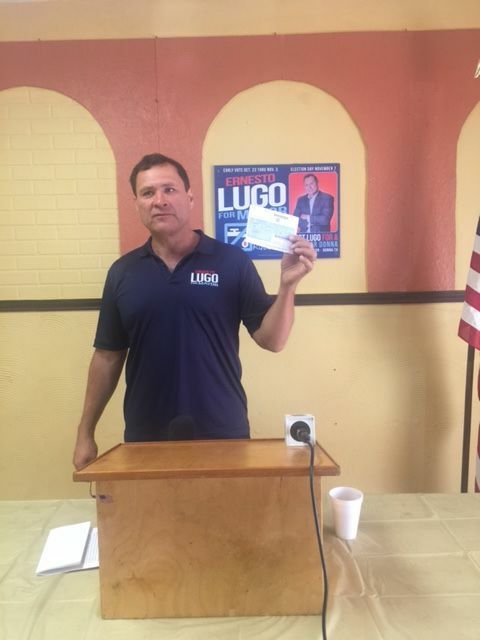 At Don Ponchito’s restaurant, surrounded by supporters, Lugo raised his voter registration certificate showing the city of Donna as one of his listed voting districts. Attempts to reach the citizen who filed the formal complaint with the city were unsuccessful. Interim City Manager Ernesto Silva said a mistake could have been made on Lugo’s voter certificate, which is issued by the county elections department. “If they didn’t have a city (listed on the voter registration certificate), then that means that they don’t live within the city limits — they live outside the city limits, in the rural area of Hidalgo County,” said Hidalgo County Elections Office spokeswoman Hilda Salinas, who commented solely on the purpose of districts listed on voter cards. Voter certificates are issued to voters as proof of registration, according to the Texas Secretary of State’s website. Cities must notify the county voter registrar’s office of any territorial boundary changes within 30 days, according to Texas Election Code. Donna City Attorney Eddy Treviño, who handles legal matters for the city, was not available for comment Tuesday. “This decision is based upon a finding that your permanent residence located at 2115 Lott Road, Donna, Texas 78537, is not located within the Donna city limits,” the letter signed by City Secretary Laura Balderrama reads. The city secretary sought the legal opinion of Treviño regarding the Lott Road property’s jurisdiction, Silva said. Silva confirmed that a development agreement was indeed signed by the property owners — Lugo’s mother Araceli Lugo and father Jose Lugo. “The problem is that the development agreement does not include this location,” Ernesto Lugo said, referring to the home at 2115 Lott Road. The city held public hearings on Nov. 28 and Nov. 29, 2016, and “begun the process to institute annexation proceedings on all or portions” of property, according to the development agreement signed by Lugo’s parents, Jose and Araceli Lugo. “That area has never been in the city,” Silva said, adding that it was not annexed. Lugo said other property, not where he resides on Lott Road, is part of “Exhibit A” in the development agreement. The Monitor requested “Exhibit A” from the city of Donna, and Balderrama said by phone that the exhibit was included in the attached development agreement provided during an open records request. The Hidalgo County Appraisal District property search result for 2115 Lott Road was attached behind the development agreement. But Lugo disputes that the search results are actually “Exhibit A,” claiming he has a copy of the exhibit to be released publicly at a later date. A search of Hidalgo County Appraisal District records finds at least 20 properties listed under Jose and Araceli Lugo. Lugo refused to release a copy of “Exhibit A” on Tuesday, adding he would consult with his attorney about the document. Development agreements alone do not list addresses, according to a set of agreements obtained by The Monitor from the city of Donna. Lugo’s name will remain on the ballot despite the city’s declaration. “I wouldn’t be spending money to try to fight a battle that’s not going to work,” Lugo said about financing his campaign. The city of Donna is not listed as a taxing jurisdiction for the Lott Road property, according to the Hidalgo County Appraisal District’s website.